NORTH LOMBOK - The Directorate General of New Energy, Renewable and Energy Conservation (DG EBTKE) last week (8/2) handed over 300 units of Public Street Lighting - Solar Light (PJU-TS) to North Lombok and Sumbawa Regency Government as a sign of completion of the Public Street Lighting- Solar Light (PJU-TS) construction in the two districts. 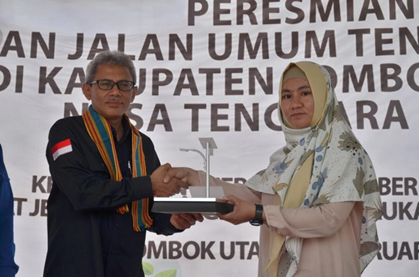 The symbolic handover was carried out by the Secretary General of the National Energy Council, Saleh Abdurrahman at the North Lombok Regent's Office, West Nusa Tenggara (NTB), witnessed by Members of the House of Representatives Commission VII, Kurtubi. PJU-TS is a street lighting lamp that uses sunlight as a source of electrical energy. The Public Street Lighting - Solar Light (PJU-TS) Development Program is an effort to illuminate the roads in areas that have not been reached by PLN electricity or in areas that have been electrified by the National Electric Company, but want to reduce the electricity consumption of the region. The installation of Public Street Lighting - Solar Light (PJU-TS) in North Lombok and Sumbawa Regencies is the proposal of the NTB Government for disaster emergency response, with the installation location of Public Street Lighting - Solar Light (PJU-TS) spread in disaster affected areas, namely North Lombok Regency with 200 units and Sumbawa with 100 units. "We have built 275 Public Street Lighting - Solar Light (PJU-TS) in North Lombok, 75 proposals from electoral districts and 200 pieces of aid for the earthquake disaster. In our land (NTB) the Government will continue to boost development in terms of energy, so that the people of NTB especially North Lombok Regency can rise again after the earthquake, "Saleh said. The construction of the Public Street Lighting - Solar Light (PJU-TS) in NTB Province is based on Minister of Energy and Mineral Resources Regulation Number 39 of 2017 concerning the Implementation of Physical Activities for the Utilization of New Energy and Renewable Energy and Energy Conservation, and Presidential Instruction Number 5 of 2018 concerning the Acceleration of Post-Disaster Rehabilitation and Reconstruction Earthquakes in West Lombok, North Lombok, Central Lombok, East Lombok, Mataram City and affected areas in NTB Province. 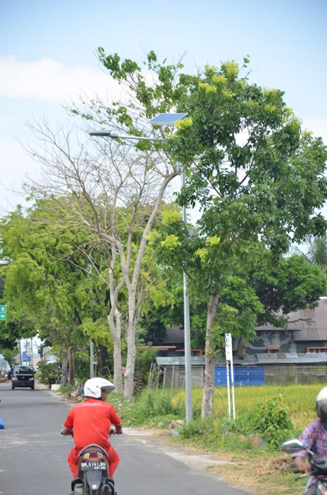 On this occasion, Saleh hoped that this Public Street Lighting - Solar Light (PJU-TS) could help restore Public Street Lighting (PJU) infrastructure damaged by the earthquake in Lombok some time ago. "Damage of the Public Street Lighting (PJU) because the earthquake caused disturbed community activities at night. For that reason, it is necessary to restore the Public Street Lighting (PJU) infrastructure to help," he said. "Hopefully the installation of Public Street Lighting (PJU) can provide benefits and help for people in West Nusa Tenggara Province, especially Lombok Regency North and in Sumbawa Regency so that the recovery of community activities can run faster, "Saleh added. "Our area is still in frequent earthquakes, shortly an electric earthquake and the electric immediately lights out. Rain falls, the lights immediately turn off. Just a little wind also lights out. Now if the earthquake, the electricity goes off but the Public Street Lighting - Solar Light (PJU-TS) stay on. To the mosque, to the market, everywhere can still work, "said Amir, one of the residents of Jenggala Village, where his village road is one of the installation points for Public Street Lighting - Solar Light (PJU-TS). "It's pretty bad now, the electricity is off, it's not too dependent on the generator. The light can reach the house. It's not dark anywhere. This also helps fishermen want to go to the sea," he added.